Y’all know how much I love The Voice, right? And I can hardly wait for the new season to start! So anyway. Hubby and I were out running errands when we heard this adorable song on the local L.A. country radio station. Okay, yes, I’ll admit, I do listen to country. Not all the time. I’m basically a rock ‘n roll girl. But on occasion, I like to switch it up and broaden my horizon. You know, see what the other half of the universe is listening to. Well, let me just say that when hubby and I heard this song, we cranked it up. Now, granted, because we aren’t the most knowledgeable people regarding the latest and greatest in the country music world, this song may not be new to some of you, yet it was certainly new to us. You’ll see what I’m talking about in a moment. First, because I was tagged by Cate Russell-Cole to participate in the “Inspiring Spaces Blog Hop”, I need to share with you what ignites my creativity. Not that you’ll find it all that interesting, but apparently, inquiring minds want to know. I think creative people have their own triggers that help them to produce no matter what art form they excel in. For me, there is no secret ingredient that sparks my imagination. My inspiration comes from many sources. For one, I need to read in order to write. And I mean a lot. I find that certain writers will ignite my creativity. If I find myself stuck, I’ll pull out a book from one of my favorite authors and away I go. Certain tastes, scents and textures can ignite my muse. I am inspired by nature. So if I’m on a walk, or down by the beach, or in the mountains, gazing at the moon and the beautiful stars above, I am inspired. So I guess being aware of all my senses can spark that gift of creativity. Yet, if you noticed, I left one of our senses out. But not just hearing. Listening. As you know, there is a difference. And it’s this difference that can have a huge influence on our creativity. If we really listen and take in all that surrounds us, there is great potential for ignition in our creativity. It’s so awesome, isn’t it? And that brings me back to our country song. “God Made Girls”, by Rae Lynn, a twenty year old, third year contestant on The Voice, under the tutelage of none other than Blake Shelton. The fact remains, the lyrics to this song are so clever that it inspired me to share them with y’all. See, I knew you’d like it! And for your listening pleasure, here’s a little inspiration from Rea Lynn. That was easier than I thought! Now it’s your turn only if you wish to participate. Since we’re all curious what inspires other writers, I am asking a few to join in the fun! They are: Jenny Hansen, K.M. Huber, Tameri Etherton, Christine Claire MacKenzie, Angela Ackerman, Pat O’Dea Rosen, Amber Medina West, Jennifer Oliver, Jennette Marie Powell and last but not least, Coleen Patrick! Inspire one another! Use a photo, video, any medium desired, which will show off your muse’s playground. The purpose is to discover something about another blogger that inspires you and to share the love around, so blogs are being seen by a new audience. 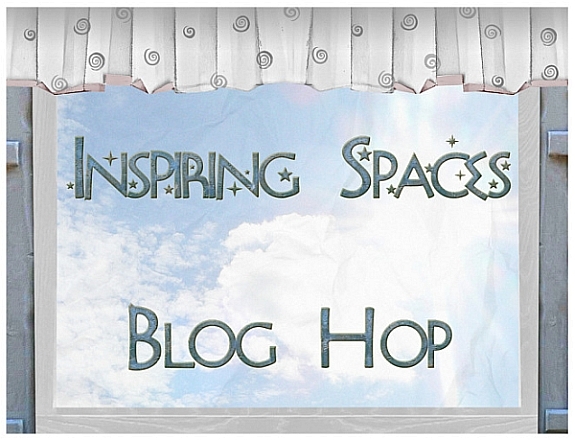 Oh and please mention that the blog hop started here. (Thank you.) Happy hopping! So what do you think? What do you have in your writing space? What do you need to get into the creative groove? Which of our five senses affects your writing the most? Do you find music inspires your creativity? If so, what kind of music do you enjoy listening to? This entry was posted in Blog Post and tagged Blake Shelton, Cate Russell-Cole, Country Music, God Made Girls, Karen McFarland, Rae Lynn, The Voice on September 10, 2014 by Karen. I shared this picture on Facebook the other day. I have to say that I am spoiled with all the lush, green vegetation right in my own backyard. Beautiful, isn’t it? But this is not South Carolina, this is Southern California. And we are in the midst of a drought. Over watering? Oh yeah. Just a little, don’tcha think? Yet, in comparison, sometimes as writers we may hit a Dry Spell. Those times when we rack our brains, searching for the right word, the right sentence, the perfect…well, you know. 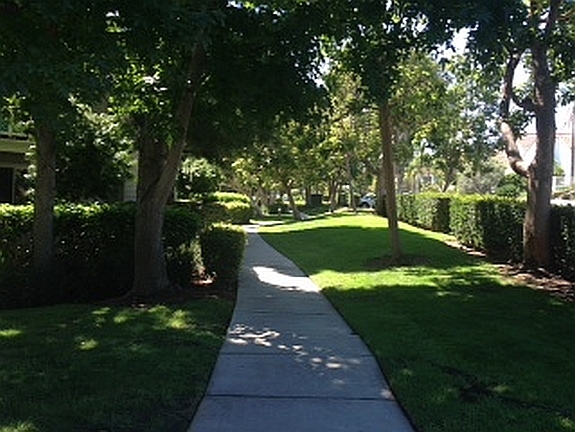 We walk along on a creative path, all green and lush as our subconscious liquidates on the page. And then something happens. We hit a dry spell. For some, this may happen all at once. For others, they may notice a drain on their stored creative juices over a period of time. Either way, their well runs dry. Let’s be honest. Many of us go through our daily routines more numerous than a single human being should be allowed. And some of us are ready to commit ourselves after a long, exhausting day spent fulfilling the many tasks that lay before us. With that kind of schedule, how is one expected to be cognizant of every single issue that happens in our world? It’s just not humanly possible. But we in California are in a dry spell and severe drought restrictions have been put into place. Hello! It certainly took them long enough. I mean, come on, this drought has been going on for years. The water supply is down to an eighteen month reserve. Yes, you read that right. Eighteen months! Blink, and it will be gone! Okay, I guess I’m as bad as the next guy because the reality of the situation didn’t hit me until I returned home from my trip from Phoenix last month. And I thought it was dry there. Practically the whole state of Arizona is desert, right? But it isn’t quite in the same league as this western Golden state which has now turned into a scorching golden-brown before our very eyes. 82 percent of the state of California is in an “exceptional drought”, the driest conditions since 1895. Record-low rainfall has sent rivers, lakes and water reservoirs to their lowest levels in many decades, threatening the water supply of many cities. In turn, this has also increased the risk of wildfires, which has already ravaged parts of the state, most recently an area near Yosemite National Park. Although the drought may alter the way we use water, the people that it affects the most is the farmer. In an attempt to keep up with water demand, many farmers are drilling new wells. Recently, in Kern County, one farmer drilled five new wells at 2,500-feet deep a piece — twice the height of the Empire State Building — in a desperate attempt to tap into new water sources below. And for the farmers less fortunate? They are bulldozing hundreds of acres of thirsty, but still reasonably healthy crops because there isn’t enough moisture to keep them alive through the worst drought people in the area have ever seen. There is a growing sense that nobody outside the San Joaquin Valley really understands the far-reaching implications of the drought, how it’s put the main source of the nation’s food supply at serious risk, threatening to disrupt an entire industry and ruin people’s lives. No food? Oh, that’s just great! Can you say Dry Spell? Yet, before we get upset because of the lack of urgency, let’s take into consideration that a drought doesn’t cause the immediate excitement that perhaps a tornado, earthquake or hurricane can. It’s been said that a drought is like watching a movie in slow motion. It’s a slow death, a silent killer—with a potential to be just as destructive. 10- Check your faucets, pipes and toilets for leaks. Replace your toilet with a low-flow model. That old toilet and a small faucet leak can waste up to 20 gallons of water. 8- Take shorter showers or perhaps take a bath instead. 7- This one’s for the kids. Turn off the water while you brush your teeth! 6- Run the dishwasher only when full. 5- Use recycled water for your plants. 4- Store drinking water in the fridge in lieu of running it in the sink to get it cold. 3- Defrost frozen food in the refrigerator instead of under the hot water at the sink. 2- Take precautions to prevent fires which occur most often in the kitchen. 1- If it’s yellow, let it mellow. If it’s brown, flush it down. Okay, you caught me. That wasn’t the number one suggestion. I just couldn’t help myself. But it is a real suggestion used in previous droughts across the country. And if we all do our part, perhaps we can help preserve our water supply for future generations, but more importantly, our Farmers! Although forecasters are now expecting an El Nino weather pattern for Southern California this winter. Yay! But I’m not counting on it. So for those of you who are being plummeted by an overabundance of rainfall this year? Send that excess moisture this way! As for the creative dry spell? I don’t think those top ten suggestions would be of any help. Yet like a drought, whether as an individual or collectively, we need to take immediate measures to keep productive. Don’t wait until you’re faced with the dangerous feeling of discouragement. Do whatever it takes to replenish that creative well! So what do you think? Have you ever experienced a Dry Spell? Did you know how bad the drought was in California? How have you recovered from a lack of creativity? What are your suggestions for water conservation? Have you been affected by the weather in your neck of the woods? This entry was posted in Blog Post and tagged Arizona, Drought, Dry Spell, Empire State Building, Grapes of Wrath, Karen McFarland, Kern County, Phoenix, San Joaquin Valley, South Carolina, Southern California, Yosemite National Park on September 3, 2014 by Karen.